Lautaro Martinez celebrates his spot-kick. 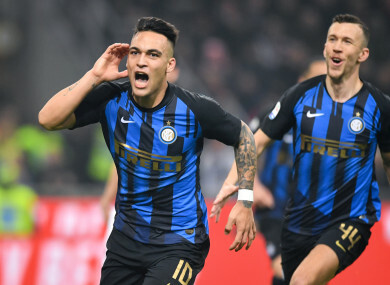 INTER MILAN BEAT bitter rivals AC Milan 3-2 in Sunday’s thrilling derby to move above their neighbours in the Serie A table, with Lautaro Martinez’s penalty ultimately proving decisive. Email “Martinez penalty proves decisive as Inter come out on top in five-goal Milan derby thriller”. Feedback on “Martinez penalty proves decisive as Inter come out on top in five-goal Milan derby thriller”.